Speedball’s Studio Essentials offering further exemplifies our desire to be the ultimate resource for artists across the most diverse range of techniques and processes. 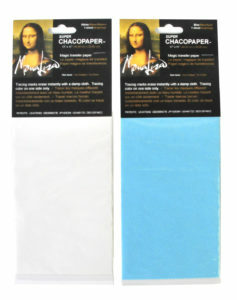 Great for use on fabric, leather, plastic, wood, glass, china and metal, Mona Lisa Super Chacopaper Transfer Paper is available in 17.5”x17.5” sheets in either blue or white. 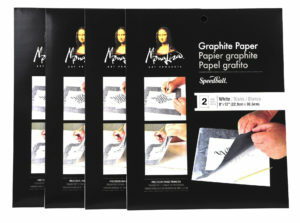 Traditional Mona Lisa Graphite Paper is also available in 9”x12” and 18”x24” sizes. Ideal for embossing and transferring designs, the Mona Lisa Double-Ended Stylus is a great addition for a range of projects. Omni-Gel is a unique, acrylic, glue-like product that has an incredible versatility, suitable for use as a transfer medium, multi-purpose adhesive or decorative paint or texturizer. It dries crystal clear for true color reproduction and its acid-free formula provides archival finishes. Available in 4oz. and 8oz. sizes.